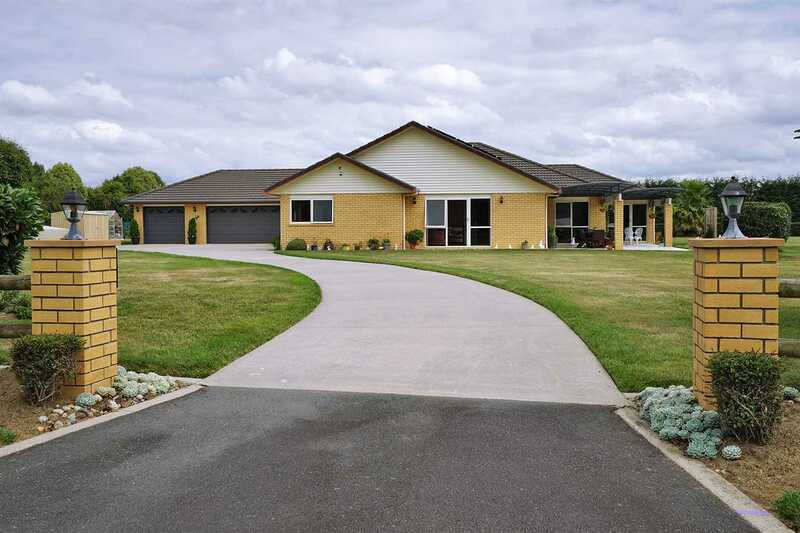 This sprawling brick residence occupies a 5460sqm flat and manicured section in a sought-after Lane in Tamahere. This thoughtfully designed home boasts a solid brick exterior and has incredibly spacious rooms which gives you plenty of space to spread out. The extra-large open plan kitchen, dining and living room is the perfect place to enjoy time with your family. The large kitchen looks out over the lush gardens and an extra feature here includes an under the bench 20 litre cylinder allowing hot water to get to the tap quickly. The addition of the breakfast bar is perfect for your morning coffee, and with lots of bench and cupboard space you'll never be short of space when creating culinary masterpieces. Flowing through from this large living area is a second extremely large lounge room which is fantastic if you enjoy entertaining - you certainly have the space to do it here. Both these living areas along with the master bedroom open out to the beautifully pathed and covered outdoor space. Perfect for summer BBQing and relaxing in the sunshine. The over-sized master suite is positioned away from the other bedrooms to ensure privacy and boasts an ensuite and walk in wardrobe along with external access to the fabulous outdoor entertaining area. The other bedrooms are all very large in nature with one bedroom having access to the main bathroom creating a semi ensuite for that bedroom. The bonus of an office space is great for those who work from home. You'll never be short on storage space as there are many cupboards and the triple internal access garaging and separate laundry room adds even more storage to this home. The spa area out the back is where you can soak in after a busy day at work. The immaculately landscaped section has been designed to be easy care and includes a glasshouse, established vegetable plot and fruit trees. The current owners have taken great pleasure in adding their own touches and features throughout which you will appreciate upon viewing. Some of these features include Solar Panels, security system and much, much more. The location is second to none, being oh so close to Hamilton City and in zone for sought after schooling of all grades. The local supermarket, shops and cafes are also all nearby.